Opened in 1962 and known locally for having the best deep fried chicken and fish in town, if not North Carolina. You'll see all kinds in line from construction workers to cardiologists. Open Tuesday through Saturday from 10am to 6pm, Price’s Chicken Coop offers the finest Southern Fried Chicken in Charlotte. Offering a variety of sides with each meal (with an option to fry it, of course) such as gizzards, liver and shrimp. 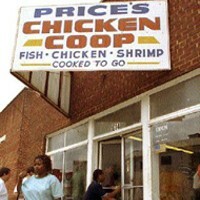 A hidden gem in South End, finding Price’s Chicken Coop may be difficult, but it’s well worth the wait. Take out only.